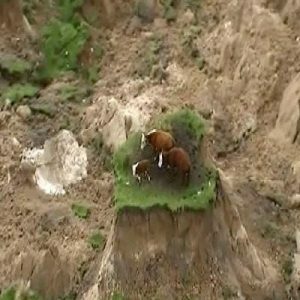 Just over a year ago, on November 14 a devastating earthquake struck the Kaikoura region of the South Island of New Zealand and the image of two cows and their calf stranded on an island in the devastated land went around the world eventually giving us the charming story of Moo and Moo and the Little Calf too. Now Moo and Moo are back, happily living on the author’s farm in the Clarence Valley and about to give birth to two new calves. Told in rhyme and charmingly sharing their new adventure this is a wonderful follow-up that helps city kids understand country life through both the story and the explanations included at the end. Even though they can be big and seem a bit scary at times, little children love cows so this is the perfect introduction to the concept of non fiction and getting information from stories as well as entertainment. And of course they will love the happy ending to what was a confronting situation! This entry was posted on November 26, 2017, in Animal Stories, Early Childhood, Non fiction, On the farm, Picture Book, Preschool, Review, Story-in-Rhyme.